My thanks to all who helped, contributed and attended the Spring Luncheon celebrating our 85th Anniversary of Empowering Women! We successfully raised over $19,000 for our Scholarship fund. We should be very proud of what we accomplished and how these funds will make a difference in the lives of young women in our community.The feedback I have received about the Spring Luncheon has been positive and all had an enjoyable time but there is always room for improvement. I welcome your input and suggestions for next year. With the summer months approaching, this means we need to get started on our next major activity/fundraiser: The Community Calendar.Many hands are needed to help with the calendar and I ask everyone to consider how they could assist Mari McDevitt.Please contact her this month to see what activity you could assist with.Many activities can be done in the comfort of your home with the AC on, such as making phone calls to find out important school dates or confirming phone numbers of local houses of worship. The Scholarship Committee has completed the process of reviewing the applications and interviewing the candidates to finalize our 2018-19 recipients.Thanks to Tish Isack and Marie Walford, Scholarship Co-Chairs and their Committee: Dorothy Lusk, Rosemary Gousman, Carol Kiley, Jean Naugle and Joanne Sheffield for the many hours devoted to choosing our scholarship recipients.Forward Together we can continue to make a difference! Please join us to celebrate our scholarship recipients on May 21st for our Scholarship Reception and Dinner which will be held at the First United Methodist Church on Terrill Road in Scotch Plains. Please sign up to attend the event if you have not already done so by sending $15.00 to reserve your place and to bring a dessert or salad and whether you could help set up or clean up.We are also accepting donations to offset the cost of the meal for the recipients and their two allowed guests.Thank you goes to Kathy Egenton and Ellen Sherry for coordinating the event that is the culmination of our College Club year. My first year as President was a year of learning.I greatly appreciate all the shared knowledge and help from Past Presidents, the Executive Board and chairpersons that guided me through policy and procedures and thanks to the many members that pitched in to make this a great year.I wish you all a restful summer and look forward to kicking off our 86th year as a club! The New/Old Board will meet on Monday, June 11th at 7:00 pm at the home of Melissa Tice, 2271 Old Farm Road, Scotch Plains.We will be having appetizers and desserts. Welcome to the “Kick-off” of another exciting year for our College Club; programs and activities have been planned and we look forward to sharing them together and with our community. As your new President, I am honored and also slightly daunted with the idea of “stepping into the shoes” that Dorothy has left; she has done an excellent job bringing us Together and Growing Stronger. I am very fortunate to have her as our Director for her guidance and support. 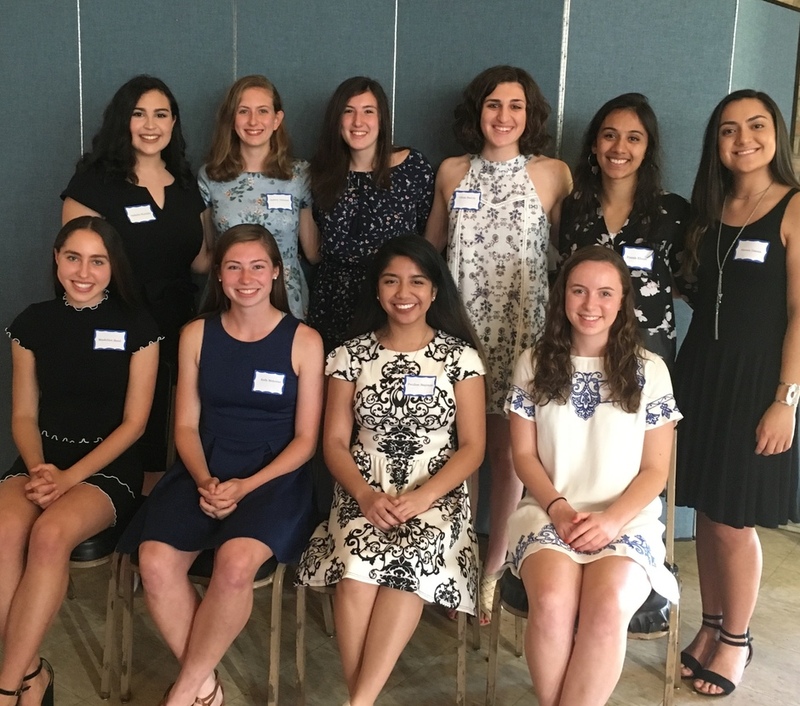 Over the summer, I unfortunately was informed of 3 member resignations and I believe we need to take a step back and focus on how we can keep current members engaged and how to attract new members to ensure we can continue to support our mission of raising funds and awarding scholarships to the young women in Fanwood and Scotch Plains in pursuit of higher education goals and desires. I plan to have some brainstorming meetings with the Officers and the Board in early September to address our membership crisis and to present these ideas at our General meeting on September 18th. I think of the song I learned in Girl Scouts… “Make new friends but keep the old, one is silver and the other is gold”….we need to reach out and welcome new and old members alike. Over these past summer months, I want to acknowledge and thank the many people that kept the wheels in motion for the Club. Thanks to Ellen Harrison and Marie Leppert for contacting speakers and scheduling another great year of monthly programs. At our General meeting in September, we will be entertained by a talented and lively musical performance by a Barbershop quartet - an upbeat way to kick off the program series! The Calendars are IN and they look fantastic!! Many thanks to Mari McDevitt and her committee for producing a high quality calendar and the numerous hours behind the scenes gathering local information, advertisements and proofing! Now we need every member to sell or buy 4 calendars.PLEASE pick them up at Jean Naugle’s house ASAP! We want to encourage our friends and neighbors to use these calendars to see the schedule of events for the College Club and local community and school activities and opportunities to enjoy them. Please remember to shop at our local merchants that support us that bought advertisements in the calendar. A key communication tool for the club is our Directory and I want to thank Pat Swick for gathering all the information and her numerous excel spreadsheets to track member data. If you still owe dues, please drop off to Pat or at the General meeting. Remember your bags of used clothes, shoes, sheets, towels, purses, toys, bikes, etc. for the Sep 16th clothing drive. Thanks to Cathy Hirschhorn for organizing this event and coordinating pick-ups at the Thrift Shop throughout the summer. Cathy will need help on the 16th and if you have any sons, daughters or young people at church or scouts that need service hours, we could use their help loading the truck for one hour that day. If unable to help with the Clothing drive, there are many other opportunities to get involved. The College club will be sponsoring the greatly anticipated College Night on November 1st. Sue Spirko will be organizing the event and she will be recruiting helpers; please see if you can spare and hour or two or donate goodies to feed the College representatives. Pat Goldberg will be organizing the hospitality. An idea that I hope you will embrace and hopefully be able to attend will be our Monthly “Fun Outings”. Every month, we will offer an outing such as going to play Mini Golf at Scotch Hills in September, Halloween Graveyard walk, a visit to the Hindu mosque, Chick movie night, Bunko, SPFHS or Union Catholic musical, etc. This gives an opportunity to socialize and get to know each other better and learn more about the wonderful women we have in the club. Family and friends are welcome to join the activities. The first general meeting for 2017-2018 will be Monday Sept 18th at the Fanwood Presbyterian church. Please arrive at 7:30 pm so we can start the program on time and enjoy the music of the Barbershop Quartet. It would be a wonderful opportunity to bring a friend, neighbor or relative to come and enjoy the entertainment and to learn more about us and our Club. I look forward for a fun and productive year ahead. Happy New Year to you and yours! I hope that you were able to share time with family and friends because that is what the holidays are all about! Now that the “warm days” of December have morphed into more typical winter weather, I hope that warm holiday glow can sustain you as the cold settles in around us. My family received an extra double dose of holiday warmth just days before Christmas as my oldest daughter, Kelly who is expecting this spring, revealed there are two little boys coming this April, hopefully not on April 10th! Although there were no regular meetings in December, many members attended our holiday party on December 5th. I want to thank Pat Swick, Liz Strong and Helen Piasecki for chairing this event. As always, we all appreciate their planning, organization and hard work along with coordination of the last minute venue change, thanks to the generosity of Karen Piasecki, Vice Principal of Union Catholic and daughter of Helen. All in all, it was an evening of merriment, delicious refreshments and good company, once again reiterating our mantra: -Together We Are Stronger- because only a team-effort could have successfully pulled off that quick change with the calm and precision that these ladies did that night! As we begin the New Year, the planning for this year’s Spring Event will kick into high gear. This event is our biggest fundraiser and we need the involvement of many members to ensure its success. Thanks to the sponsorship of Mari McDevitt, our venue at Plainfield Country Club in Edison will provide an elegant setting and, with the assistance of ALL of our members, we hope to raise more money than ever for our scholarship fund. However, we cannot accomplish this without your help! At the January meeting we will continue to discuss how every member will assist with this year’s Spring Event. Speaking of meetings, I would be remiss if I did not mention how informative and timely, given current circumstances in our world, Jennifer Olmsted was with her talk on Conflicts in the Middle East as They Have Affected Women and Children in November. We anticipate an interesting program at our January 18th meeting when Mark Di Ionno, Star-Ledger columnist, discusses his journalism career and upcoming book, The Last Newspaperman. I’m looking forward to catching up with everyone on the 18th. Although September is the ninth month of the calendar year, I always think of September as the beginning of the year. Perhaps it is because I never grew out of a school­driven schedule from the time I was a child myself, to a parent of school children as well as an elementary school teacher. Coming out of the hot and slower­paced days of summer, September symbolizes a fresh start – both with the new school year and a new year for College Club. Remember our theme: Together we are stronger and possibilities abound for what we can achieve this year with a membership of 62 dedicated women. We are happy to welcome new members Mary DePaola and Helen Ling to our College Club family. Ellen Harrison, Marie Leppert and their team have scheduled another year of enjoyable and educational programs and I hope you will attend as many meetings as you can. Not only will you be entertained and enlightened, but you will share in the camaraderie of a group of intelligent and motivated women. 2015 marks the 82th anniversary of the founding of College Club as well as the publication of our 52nd calendar. Although College Club takes a summer hiatus, much work is accomplished during this time to produce our Community Calendar and our Directory, which are both available for pick up at the home of Jean Naugle. Each member is required to purchase or sell four calendars as part of her membership commitment. Thank you to all those members who responded to the June 30th deadline for dues payment. My thanks goes to our Co­Vice Presidents, Pat Swick for the hours she has devoted to producing this year’s Directory and to Jean Naugle for handling the distribution of the calendar and directories. A big thank you goes to Mari McDevitt and her Committee for again producing a beautiful calendar. Thank you to Barbara Cronenberger who single­handedly inputted all the information into the calendar. Thanks to all those on the Calendar Committee who made calls to organizations, solicited new advertisers, chose the calendar cover, helped with proofreading or distribution and did all the work essential to the calendar production. Autumn is the beginning of many activities for the Club. Our annual Clothing Drive is scheduled for Saturday, September 19th. Thanks to Cathy Hirschhorn for organizing the clothing drive and the summer schedule of clothing pick­ups. The Scotch Plains Thrift Shop has greatly helped us with their clothing donations. Please support the shop by donating your better quality clothing to them, saving the rest for our clothing drive. We are again participating in the Lord & Taylor fundraiser on October 29th. Carolyn Dittus and Ginger Rachko are co­chairing this fundraiser and will be selling tickets at our September meeting. The evening of November 10th will be College Night at SPFHS. Co­chairs Sue Spirko and Joanne Glover have been working on this annual event and will be looking for volunteers to help that night. The first general meeting of the 2015­2016 year will be Monday, September 21st. That evening, we will have a presentation led by Scotch Plains­Fanwood High School alumna, Meg Reilly ’08. The title is “Adventures on the High Seas in a Year­long 47,000 Mile Ocean Race”. This would be a wonderful meeting to bring a guest and I would encourage you to invite a friend, neighbor or relative to join us that evening. I look forward to beginning the new College Club year and to seeing you all on the 21st. Happy Valentine’s Day goes to all our sweet, active and sustaining members and a heartfelt thank you to John Klock who gave us much to think about at our January meeting. John’s presentation on “The Language of Time” was filled with interesting facts and anecdotes. Thanks also to John for donating his honorarium back to College Club. Although April is a few months away, it is not too early to begin concentrating on our biggest fundraiser of the year, the annual Fashion Show. With the theme “The Great Gatsby Meets the 21st Century” and our new venue, Twin Brooks Country Club in Warren, this year’s Fashion Show promises to be the best ever! Have your friends, neighbors and relatives save April 22nd for an afternoon of fun and fashion. If you have not already signed up to help with the Fashion Show, you can contact Chairs Renate Gravers and Marie Leppert. We need your time, talent and support to make this fundraiser a success. It is also not too early to begin thinking about where you would like to serve in College Club next year. As we wonder what 2012 will bring, think about what you will bring to the Club in the coming year. Please contact me if you are interested in a position on the Board or in chairing a committee. Board members who are interested in remaining in their current position should also contact me this month. In February, we focus on women’s heart health at our monthly meeting. To complement our theme, let’s give from the heart and bring canned goods to our February 27th meeting to donate to our local food pantry. Donations to the food pantry decrease sharply after the Holidays while the need stays the same. Thank you in advance for your donations and I look forward to seeing you all on the 27th! As I sat down to pen this message, I thought about how different a message I would have written just a week ago. I would have talked about the summer's record high heat, the earthquake and vacations, all of which have been eclipsed by the visit of Hurricane Irene. The hurricane and its aftermath served to remind me of the really important things in our lives - family and friends, food and water, shelter and safety. For some of us, the hurricane was a minor inconvenience. The flooding that occurred in Cranford, Bound Brook, Manville and other towns showed us how lucky we were to escape that kind of destruction. We can be thankful we live in communities where people care about one another and have the resources to rebuild. The encounter with Irene brought many positives to my neighborhood – meeting neighbors for the first time, sharing as a group, many hugs and acts of kindness. If you are aware of any member in need of assistance due to the hurricane, please contact me at joanmarie@prodigy.net. Although we do not meet as an organization during July and August, many of our members have been working through the summer on our 2011-2012 College Club Calendar. Thanks to Chair Mari McDevitt, Production Chair Mary Clare Levins, Marketing Chair Dorothy Lusk and Distribution Chair Connie Salisbury who put in hours of work to produce the calendar. Thanks also to Linda Squires, who spent many hours inputting the data for the calendar and to Renate Gravers, who worked to obtain those final advertisers. Mari has been our Calendar Chair for many years and deserves special thanks for overseeing this important fundraiser. As it takes a village to raise a child, it takes many women to produce our calendar and my thanks to all who helped with advertising, inputting, production, proofing, marketing and distribution. If you have not picked up your calendars, please contact either Dorothy Lusk or Connie Salisbury to arrange a convenient time for pick up. Calendars are $10.00 and each member is required to purchase or sell four calendars. Your Directory can be picked up at the same time. Speaking of the Directory, many, many thanks to Pat Swick for the hours she spent in putting together this year's Directory and for her assistance to me in several areas over the summer. When Meril Davies and I set a goal of ten new members for 2010-2011, we realized it was an ambitious one. We actually had eight new members join and are happy to welcome Pat Goldberg, Barbara Hamilton, Sue Spirko, Barbara Gawryluk, Carol Lutz, Mary Kelly, Beth Baliko and Janet Killeen to our College Club family. Autumn will be filled with several events for College Club. You have received e-mails from Cathy Hirschhorn about our Clothing Drive scheduled for October 22nd. The Scotch Plains Thrift Shop has been an invaluable resource with their donations of clothing. I encourage you when cleaning out your closets to support the Thrift Shop with better quality clothing, saving the rest for the Clothing Drive. We raise funds by the pound so check with Cathy for items that are acceptable and include those heavy outdated winter coats! We are again participating in the Lord & Taylor Fundraiser to be held October 26th. Carolyn Dittus and Ginger Rachko are co-chairing this fundraiser and will be selling tickets at our meeting in September. The night of October 26th is College Night at SPFHS. Co-Chairs Cathy Hirschhorn and Jean Naugle have been working on organizing this annual event. If you would like to volunteer to help with College Night, sign up at the September meeting. Although it's early, mark your calendars to reserve April 22nd for our Fashion Show at Twin Brooks Country Club in Warren. My heartfelt thanks go to Renate Gravers and Marie Leppert for agreeing to again co-chair our major fundraiser. The first meeting of the 2011-2012 year will be on Monday, September 26th. Plan to be at the Chelsea in Fanwood at 7:30 that evening to enjoy refreshments and talk with friends. Our program will start at 7:45 with friend of College Club Skip Ungar entertaining us on the piano. Bring a friend, relative or neighbor as a guest and introduce them to our Club while we enjoy songs from Broadway. Try to be at this meeting and attend as many meetings as possible during the year. Get involved, participate in our fundraising efforts and sign up for a committee, if you have not already done so. I look forward to seeing you all September 26th!